This article is a short summary of Pokémon Sun and Moon. 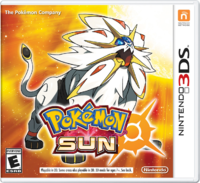 Pokémon Sun and Pokémon Moon are the eighth pair of main games in the Pokémon franchise, and the first and primary games to be released as part of the series' seventh generation of games. Announced in a special Nintendo Direct on the release date of the original Pokémon Red and Green, the two games were released for Nintendo 3DS in most regions on November 18 2016, and will be released in Europe on November 23, as part of the Pokémon 20th Anniversary celebration. In Europe, these games will launch with "Fan Editions", which include a copy of the game and a steelbook case featuring the Legendary Pokémon of each game and a map of the Alola region on the inside. In North America, players can purchase a "Steelbook Dual Pack" exclusively on Amazon, which comes with both games in a steelbook case, or a "Dual Pack" exclusively at Target stores packaged with figurines of the three starting Pokémon. A pair of follow-up games, Pokémon Ultra Sun and Pokémon Ultra Moon, were released in November 2017. Pokémon Sun and Pokémon Moon are set in the new Alola region, consisting of a series of four tropical islands. Three months prior to the events of the game, a girl is shown attempting to escape from a group of pursuers. Although she is cornered, she is suddenly teleported out of the area. When the player arrives in the Alola region, they set off on the island challenge, in which one must clear a series of trials across all four islands. Along the way, the player encounters Team Skull, a group of thugs who steal Pokémon. Also in the region is the Aether Foundation, a group dedicated to the protection and preservation of Pokémon. Rather than taking on a series of eight gyms to battle the Pokémon League and become the region's champion, Pokémon Sun and Pokémon Moon instead has players traveling around the Alola region taking part in the island challenge, a rite of passage in the Alola region in which trainers must complete a series of trials on each island, culminating with a battle with the island's Totem Pokémon (a stronger version of a normal Pokémon) and after that the Island Kahuna, with the goal of becoming the island challenge champion. The battle system has also been adjusted from previous games. While the core mechanics have not been changed, the player can tap the Pokémon sprites on the bottom screen to see each Pokémon's stat buffs and debuffs. In addition, by pressing L and A simultaneously when selecting a move the player can view its information, and if the player has battled the Pokémon before then the move list will indicate how effective each of the player's moves are on the opposing Pokémon. Finally, by giving a Pokémon a Z-Crystal, they are able to unleash Z-Moves, powerful attacks that can only be used one time per battle. 1.1 January 10, 2017 Fixes glitches. 1.2 May 17, 2017 Fixes a bug involving Pokémon being unable to attack and switch during Sky Drop and when knocked out by Spiky Shield, fixes a glitch with Poké Pelago when a new month starts, fixes a rare bug in which the game ends when an Evolution-inducing item is the last one in the bag, fixes a bug that causes Scatterbug to not learn Egg Moves, fixes a bug that allows players to give Eggs held items, fixes a glitch that ends a tournament when pre-registering for an online Friendly Competition. ↑ 1.0 1.1 Pokémon Sun and Pokémon Moon. Pokemon.com. Retrieved February 26, 2016. ↑ 2.0 2.1 Pokémon Sun and Moon. Pokemon.co.jp. Retrieved August 30, 2016. ↑ 3.0 3.1 Pokémon Sun on Nintendo.co.uk. Retrieved August 30, 2016. 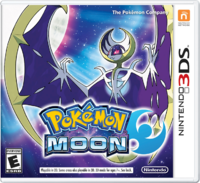 ↑ 4.0 4.1 Pokémon Moon on EB Games Australia. Retrieved August 30, 2016. ↑ Pokémon Sun and Moon on the Korean Nintendo website. Retrieved August 30, 2016. ↑ Pokémon Sun. Nintendo.de. Retrieved August 30, 2016. ↑ "These #PokemonSunMoon - Fan Editions, including exclusive SteelBook cases, hit Europe on 23/11!" Nintendo UK on Twitter (June 22, 2016). Retrieved June 22, 2016. ↑ Pokemon Sun/Moon getting "Steelbook Dual Pack". Nintendo Everything (July 12, 2016). Retrieved July 13, 2016. ↑ "Exclusively at @Target, #PokemonSunMoon Dual Pack featuring a set of first Partner Pokémon figures!" Nintendo of America on Twitter (November 18, 2016). Retrieved November 18, 2016. ↑ Pokemon Sun/Moon update out now (version 1.1). Nintendo Everything (January 10, 2017). Retrieved January 11, 2017. ↑ Pokémon Sun and Moon Version 1.2 Is Now Available for Download. Nintendo Life (May 16, 2017). Retrieved May 17, 2017. ↑ Pokémon Sun and Pokémon Moon Have Been Updated to Version 1.2. Pokémon Global Link (May 16, 2017). Retrieved May 17, 2017. This page was last edited on 4 November 2018, at 21:17.